At the upcoming Rob|Arch 2012 conference, 8 universities are organizing robot workshops and 18 papers will be presented, alongside cutting edge developments of industry partners. As even a five-day event cannot cover the whole scope of robotic fabrication in architecture, art, and design, the Association for Robots in Architecture invites research institutions and companies, as well as individual artists, architects, designers, engineers, researchers, and students to submit video presentations of their “robotic” work to the Rob|Arch 2012 conference. The video clips should showcase new developments and innovative projects that are relevant to the conference topic of robotic fabrication in architecture, art, and design. All video presentations that get approved by a jury of experts will be shown at the conference/exhibition to the Rob|Arch 2012 attendees, among them CEOs of major robot companies as well as industry partners and internationally recognized researchers, architects, and artists. Furthermore, they will be published on the Rob|Arch conference homepage, www.robarch2012.org, to a wide internet audience. To submit a clip, please go to http://videosubmission.robarch2012.org and click on Make Submission. The Submission page contains detailed instructions regarding the required video format. 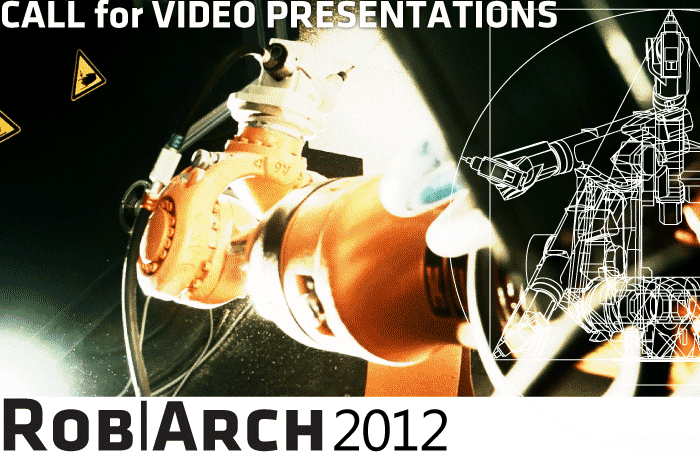 Rob|Arch 2012 is the first international conference on robotic fabrication in architecture, art, and design. From December 14th to 16th, eight parallel robot-workshops led by internationally recognised specialists from institutions such as the University of Stuttgart, TU Delft, ETH Zurich, TU Graz, SciArc, University of Michigan, Harvard, and TU Vienna will take place at four locations distributed throughout Europe, immersing participants to cutting-edge robotic research. The results of the workshops as well as research projects, chosen by the scientific committee, will be presented and discussed at the conference from December 17th to 18th. Keynote lecturers Fabio Gramazio and Matthias Kohler from ETH Zurich, Achim Menges from the University of Stuttgart, and artists Clemens Neugebauer and Martin Kölldorfer will show different approaches how robots can be used in the creative industry. The production of the conference workshop documentary and the live broadcasting at the RobArch-Pavilion will be performed by NEVV.ORG digital media.